More than 3,500 fatal crashes involved large trucks in the United States in 2015. Beyond the fatalities, 83,000 accidents involving large trucks resulted in injuries that year. Not surprisingly, people in passenger vehicles often suffer serious injuries or death in collisions with 80,000-pound tractor-trailers. Truck accident claims are complex cases involving federal regulations and often several potentially responsible people. Knowing the facts can help you make wise decisions if you or a loved one is injured by a truck. What should I do if I’m hit by a truck? If you are involved in a collision with a large commercial truck, the first thing to do is call 911 for emergency medical attention, and report the accident to the police. Do not move your vehicle, unless it is in an unsafe place. Its position can help experts reconstruct what caused the crash. Cooperate with the police when they arrive, but do not give them unnecessary details. Do not talk to insurance company representatives, other than your own. Never give the other insurance company a statement in writing, by phone, or sign anything for them until you consult with an attorney. Get medical attention for your injuries immediately. Take down information from the other drivers involved, including their insurance company and how to contact them. If possible, take photos or record license plate numbers, so the driver can be located easily. Use your cell phone to take pictures of the accident scene, and check for any surveillance cameras in the area if possible. Notify your insurance carrier of the accident. Then schedule a consultation with a skilled Virginia vehicle accident lawyer. 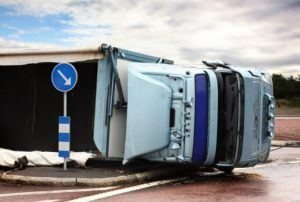 Before filing a truck accident claim, you need to know how bad your injuries are, and who is responsible. Our truck accident lawyers at GibsonSingleton Virginia Injury Attorneys can assess your injuries and thoroughly investigate your accident. If the truck driver or trucking company was at fault, we can obtain documentation from the other side, including the truck driver’s log book and the truck’s on-board data recorders, scale tickets, and bills of lading. We handle truck accident cases on a contingency basis, which means we do not get paid until we recover compensation for you. We do not charge for consultations. If you or your loved one has been seriously injured in a collision with a large commercial truck, contact us or call us at (804) 413-6777 or toll-free (855) 781-6777 for a free consultation. $350,000 Compensation - Man was hurt in a tractor trailer accident on the highway. $42,000 Compensation - Man suffered multiple injuries after a truck ran a red light and crashed. Should I Be Cautious Around Big Trucks on the Road?